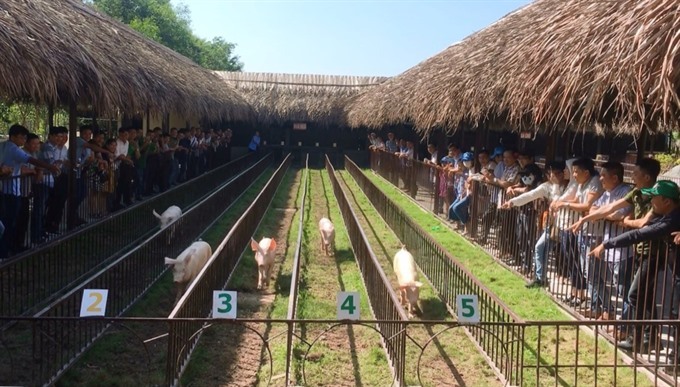 Have you ever attended a pig race like the one held regularly in Cần Thơ City? If not, you should visit the Mỹ Khánh Tourism Village in the Cửu Long (Mekong) Delta city. About 10 km from the city centre, the famous eco-tourism village covers an area of over 35ha in Phong Điền District’s Mỹ Khánh Commune. The pig race is held three times a day, and four times on Sunday and public holidays. The racecourse includes five tracks of 40 metres long and is separated with steel barriers. Each race involves five pigs and lasts 10-12 seconds on average. The rule is simple: the first pig that reaches the finish line is the winner. Nguyễn Thị Ngọc Giàu, a pig trainer in the village, said that pigs aged from two months were selected and trained for racing for about two weeks before joining the races. They thrive on routine and race for about three months. Thereafter, they are sold for pork meat. “We use sticks to tap on the barriers to create sounds for the pigs to listen to and practice,” Giàu said. Before each competition, an MC introduces the pigs that hailed from various provinces and cities across the country. One pig had five competitors with numbered names: No. 1 was from Hanoi, No. 2 from the central city of Huế, No. 3 from HCM City, No. 4 from Cần Thơ City and No. 5 from the southernmost province of Cà Mau. To spice up the race, organisers sell lucky tickets worth VNĐ20,000 (US$0.86) each to audience members. After the MC shouts the start of the race, the pigs gallop forward as the audience yells and screams. Nguyễn Phước Thanh Trân, a tourist from Đồng Tháp, said he had never before been to a pig race. “It’s new and interesting, and really fun,” he said. “The pig looks very funny when they try their best to run,” said Hoàng Danh Thái from Hanoi. The winner of the race is offered a good meal at the ending point as members who won lucky draw tickets receive ceramic piggy banks as a gift. Phạm Minh Sáng, deputy director of Mỹ Khánh Eco-Tourism Co., Ltd, said the village’s management board regularly visits localities and other countries to learn about tourism trends. Sáng said Thailand’s pig races are interesting, so he launched the race during Vietnam’s National Tourism Year 2008. “All of the ‘pig athletes’ are chosen from domestic pigs in Cần Thơ, so it’s easy for us to develop new groups of pig athletes,” he said. For many years, most tourism companies in the city include the pig races in their tour programmes, which have become a top attraction. “It’s successful because it doesn’t exist in any other province or city in the delta region,” Sáng said. Mỹ Khánh Tourism Village, which opened in 1996, is among the most-visited spots in Cần Thơ City for both domestic and foreign tourists. Many kinds of fruits and specialty foods are offered at the village which has ancient houses, and performances of folk songs and music of the southern region, and folk games, among other activities.